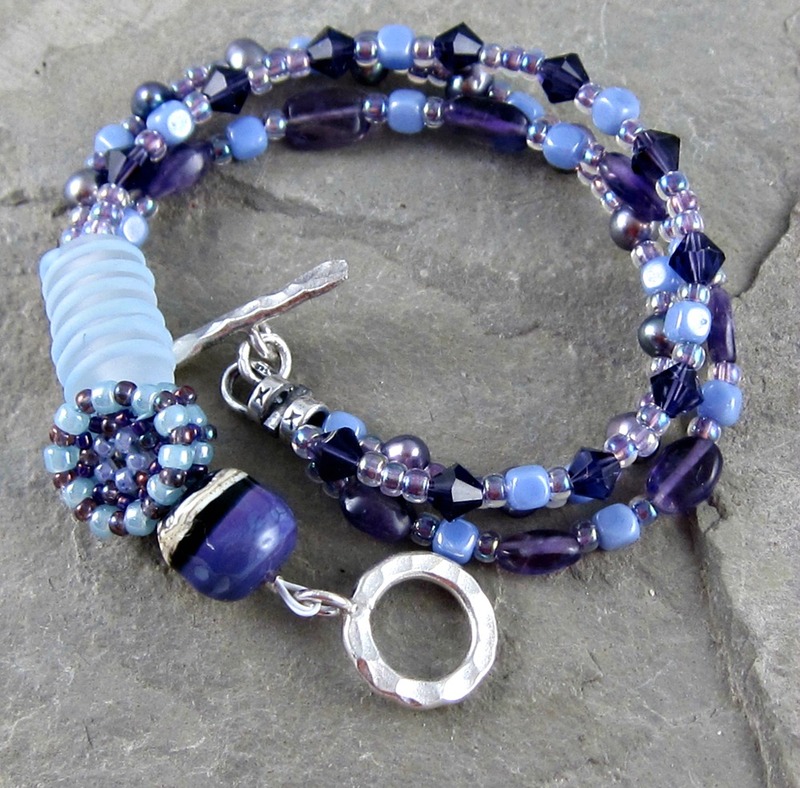 Caroline Dewison, of Blueberri Beads, was our component hostess this month. Everyone received one of these unique and awesome lichen components. I love how Caroline’s lichen have little cup shapes. 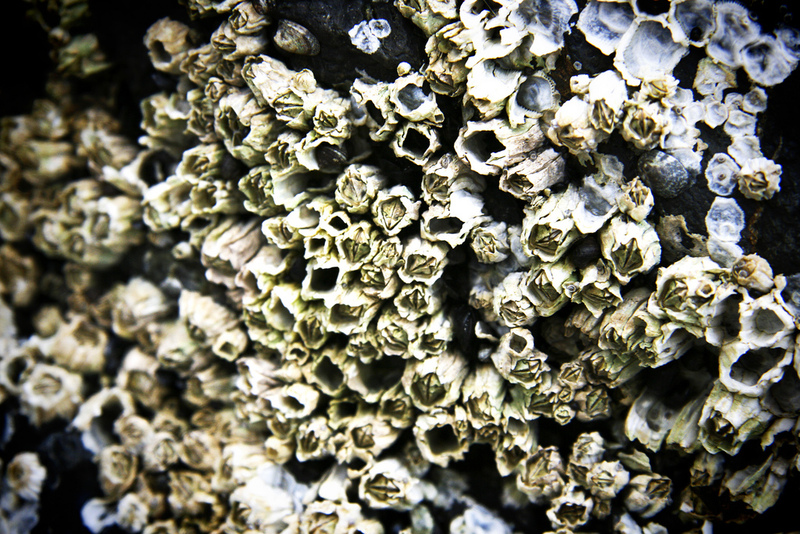 This photo shows some similarly shaped lichen, that I saw during a walk, with my husband on the beach. 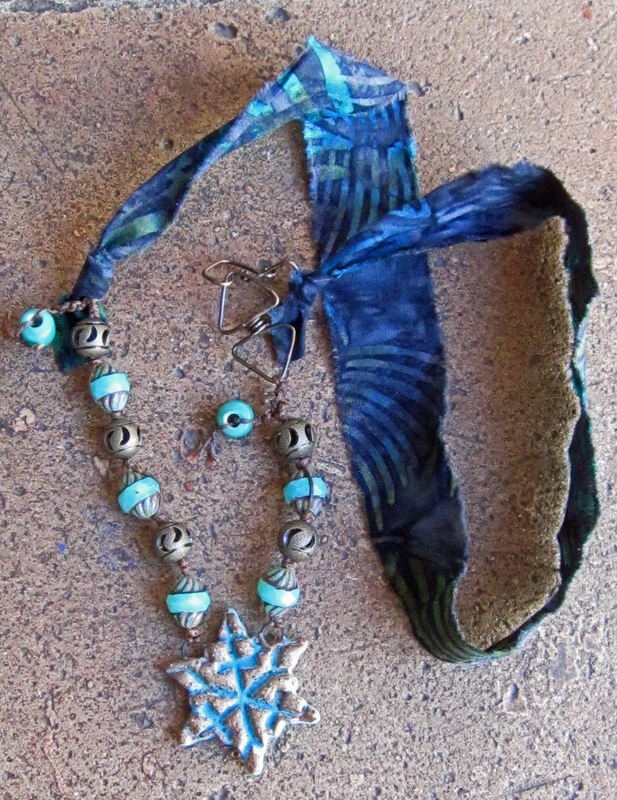 And here’s the lichen necklace, that I designed with Caroline’s pendant. The green is quite intense, so I wanted a neutral background color, where the eyes could rest. So I picked up the gray background in the pendant and added gray wooden cubes, 3 gray polymer rounds and some gray titanium hematite tubes that I picked up at Bead Fest last August. 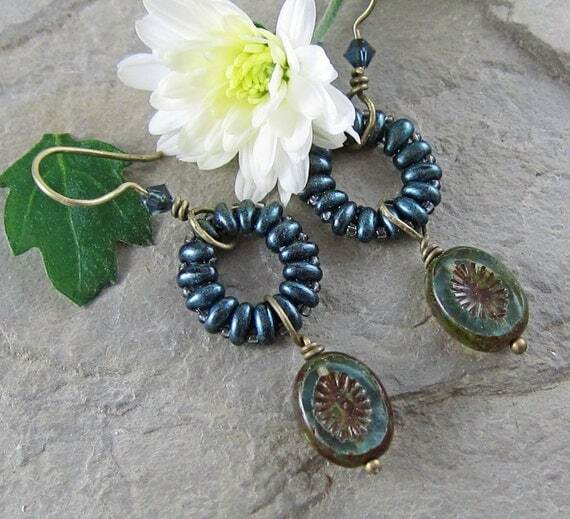 A rounded triangular polymer clay bead by Staci Louise Originals in black and straw-brown furthers the muted tones. I highlighted the green, with a great, textured ceramic tube bead by White Clover Kiln. I also used some green pearls, 2 green rubber rings and fun, green pellet beads. 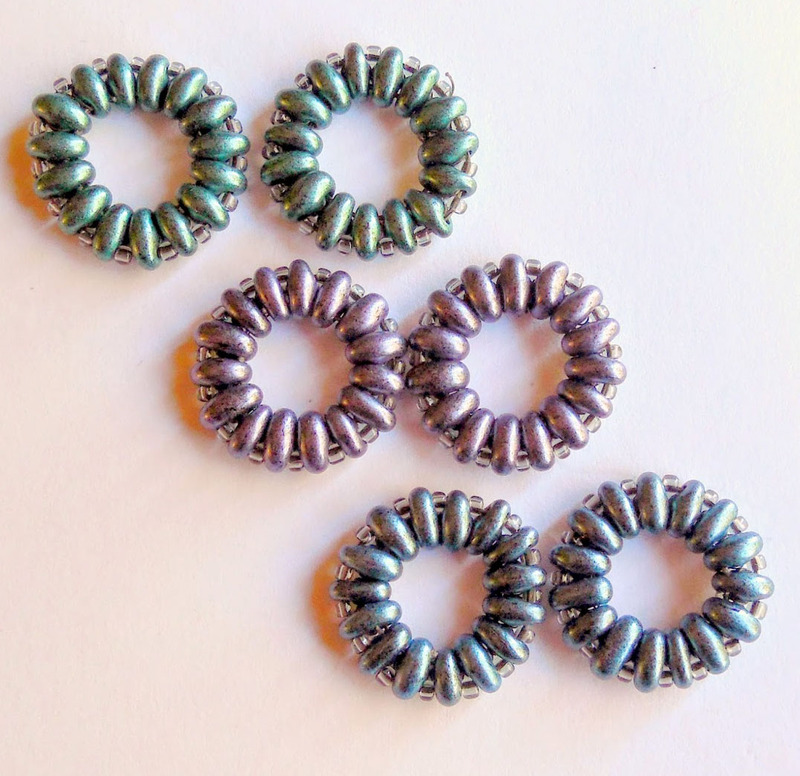 I had some glass druk beads from Bead Fest that are the exact teal-turquoise color as the center of the lichen “cups”. So I added 3 of those to accent the lichen centers. And here’s why the title of this post says that the Reveal is doubled. When we had the August COM Reveal, I could only show a work-in-progress photo of the necklace I was making with Diana’s pendant. Well, it’s finally done, so I’m sharing the finished necklace now! In addition to the pendant, the turquoise, ceramic round bead was also made by Diana. 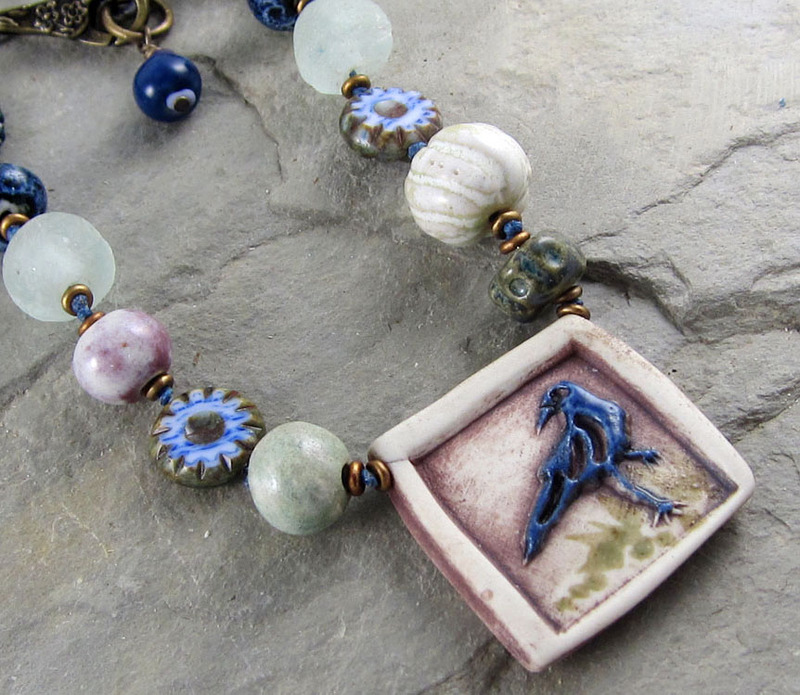 Artisan ceramic beads by Karen Totten of Starry Road and Gaea are also included in this necklace. 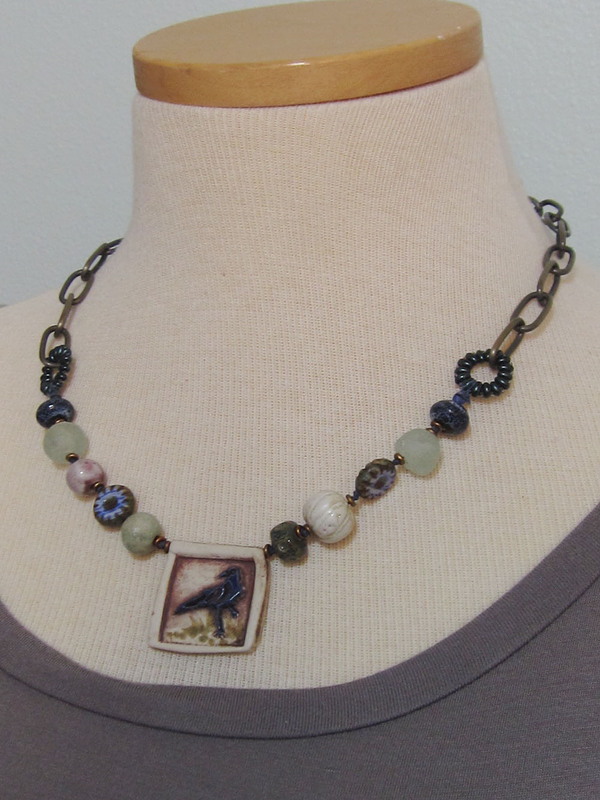 The beads are strung on Irish waxed linen and the chain is upcycled from an old purse of mine. This necklace is now available in my shop. I want to thank Caroline for sharing her lichen pendants with us. It was a delight to work with. 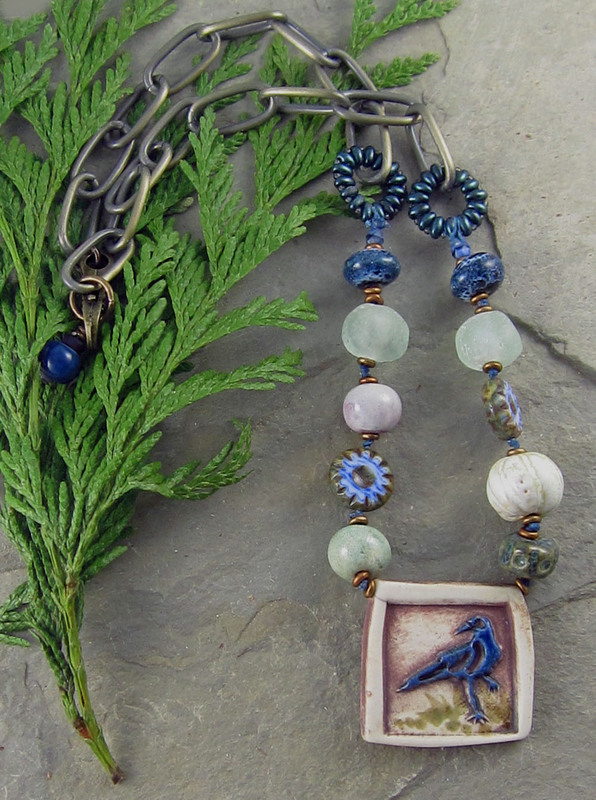 This is a blog hop and I encourage you to visit the blogs listed below to see what the other participants have made with Caroline’s stunning pendants. 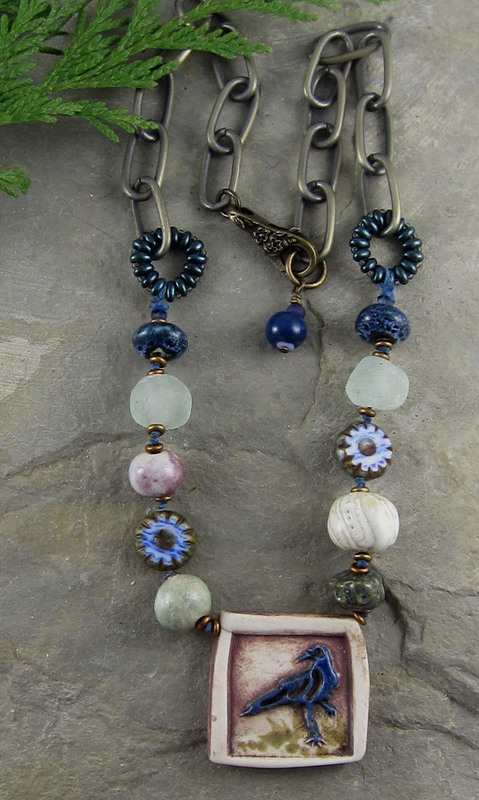 This month’s Component Of The Month was made by Art Jewelry Elements (AJE) team member Niky Sayers. 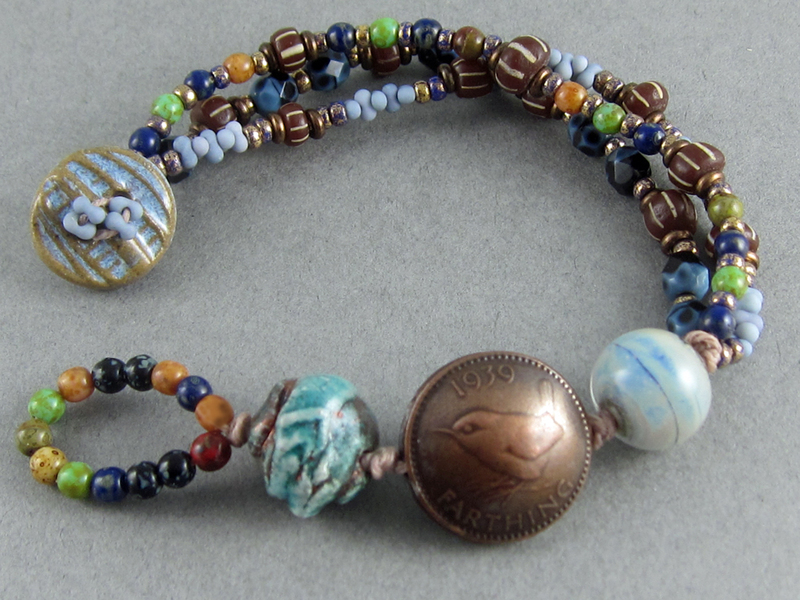 Niky, who is from London, England, used 2 old farthing coins to make a very cool bead. I didn’t know how much a farthing was worth or when it had been in use, so I looked it up. A farthing was worth a quarter of an old penny and there were also half farthings and 3 quarter farthings. They were taken out of circulation in 1961. 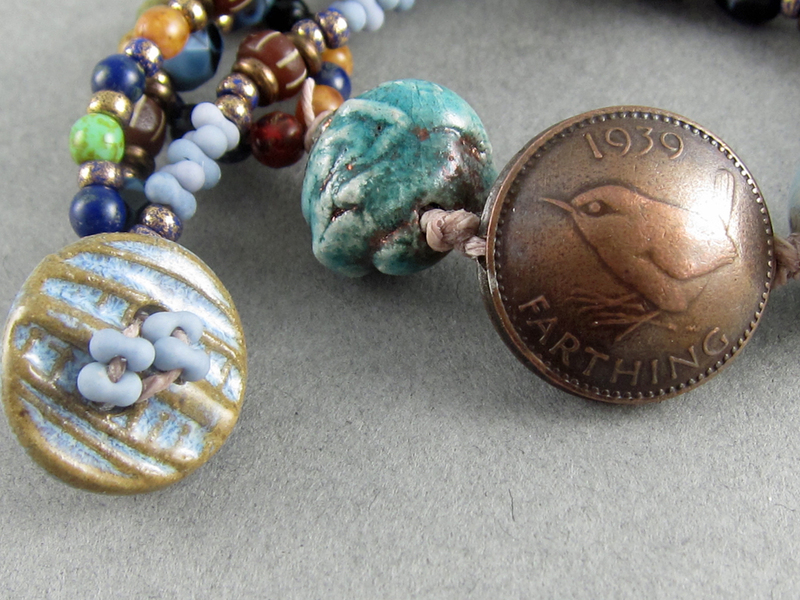 I knew that I wanted to make a multi-strand bracelet with my farthing bead. I thought this raku bead, from Odd Designs, would add some color while also tying in with the coppery color of the coin. At that point I decided to go for blue and coppery brown in the whole bracelet, along with some smaller spots accent colors. 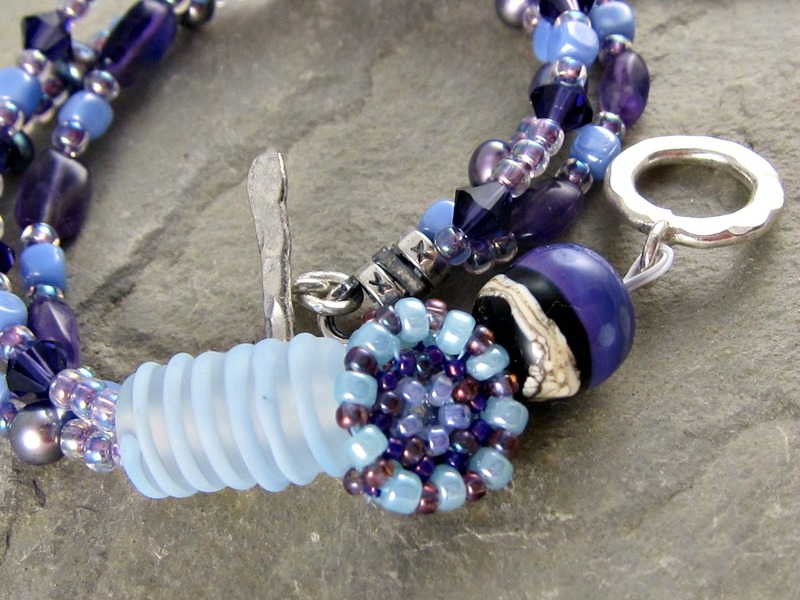 The blue lampwork glass bead (above, right) by Jen Cameron of Glass Addictions was perfect for my third focal bead. 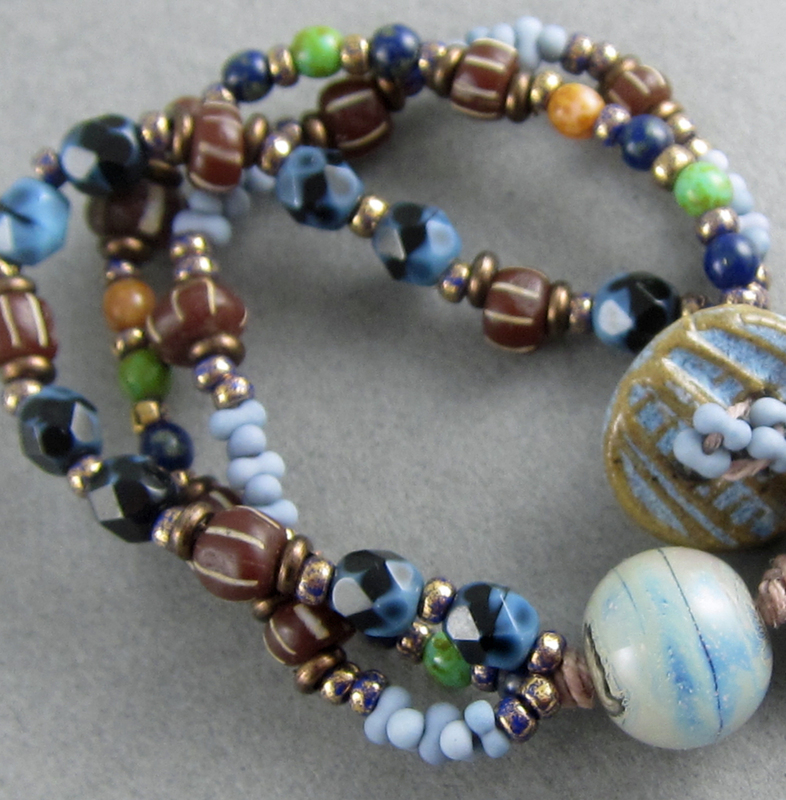 Each of the three strands of smaller beads has a mix of blue and brown glass beads, with some accent colors and some small copper heshe.. 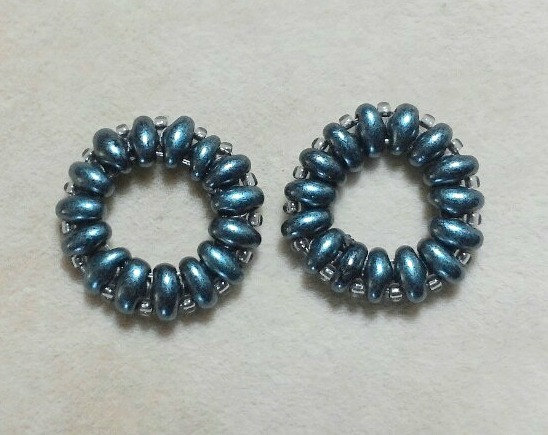 Although each strand is different, they all have some blue glass seed beads with a copper sheen and some of the copper heshe. These common components help to tie the overall design together. 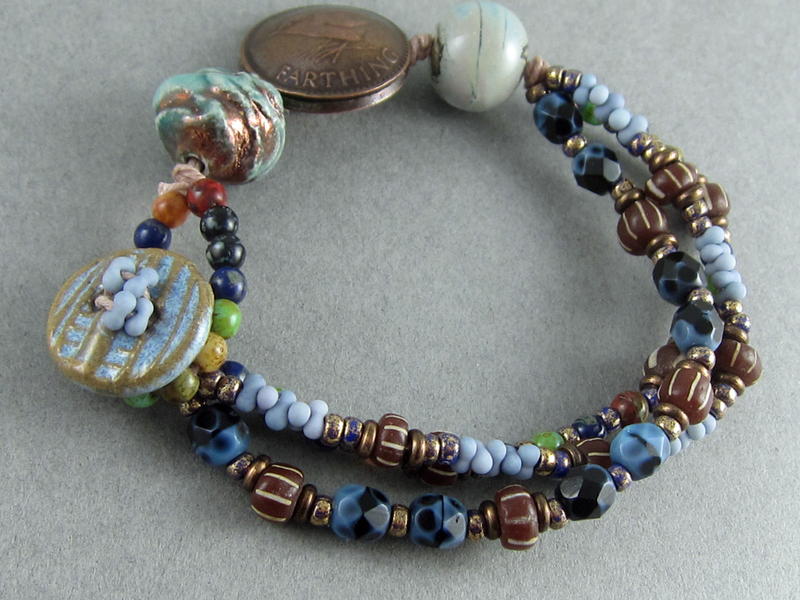 I finished the bracelet with a handmade ceramic button by Karen Totten of Starry Road Studio. Thank you Niky for sharing your awesome metalsmithing skills with us in the form of this uber-cool bead! 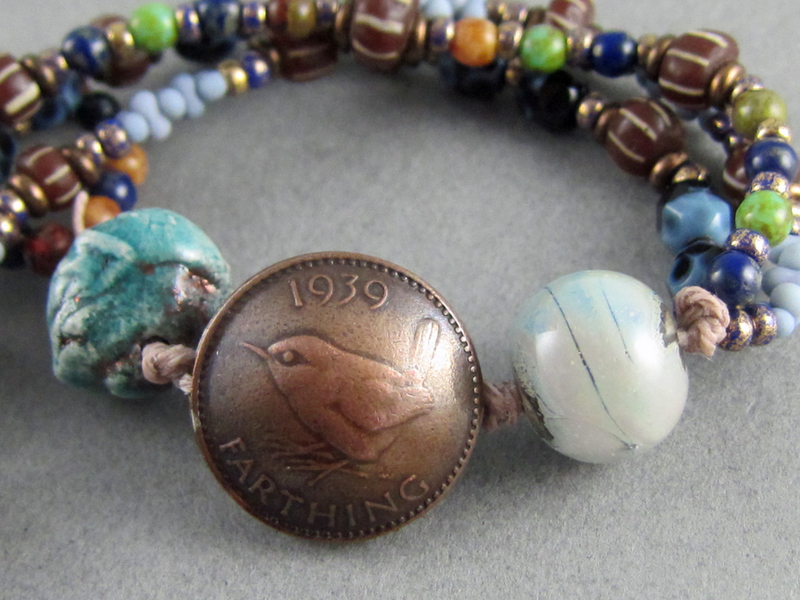 In addition to the AJE team members, 3 lucky guest artists also received farthing beads. My Farthing Bracelet is available in the bracelet section of my shop. Check out the blogs listed below to see what everyone else made with their farthings. I am always delighted to read your comments! Hope to hear from you.! 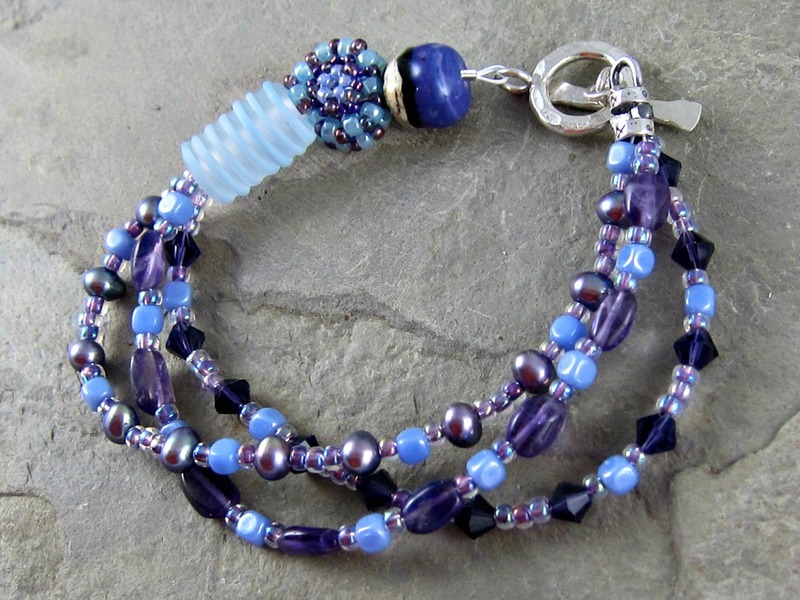 This month’s components are beautiful beaded beads by Sue Kennedy of Sue Beads. I love her beaded beads and her color choices! Sue’s beaded beads are an obvious choice for earrings, but this time I decided to switch it up a bit and make a bracelet. I paired Sue’s bead with a lampwork bead by my friends at Beads and Botanicals. and a pretty matte bead with light blue stripes. I enjoy making bracelets that go from one strand to multi-strands and that was my approach here. When I started my Facebook Destash Group several weeks ago, I realized that I’d been neglecting my gemstone collection, so I chose some amethysts and pearls for the for the first two strands. Although I rarely use Swarovski crystals any more, they were exactly what this bracelet called for in the third strand. While I like each strand to be different, I try to tie them all together with some repeating components, in this case, I have light purple seed beads and small, blue cubes in every strand. At this point, I knew that my usual brass or copper clasps were not going to work at all for this bracelet. Instead I selected a beautiful, hammer textured sterling silver toggle clasp. Ooo, so lovely! When I was a kid, I had a little garden plot where I grew purple irises. They made me happy and so does this “Iris Bracelet“. Check out my new life-sized wrist model! This is her début! Does she help you picture how the bracelet would look on you? I hope so. 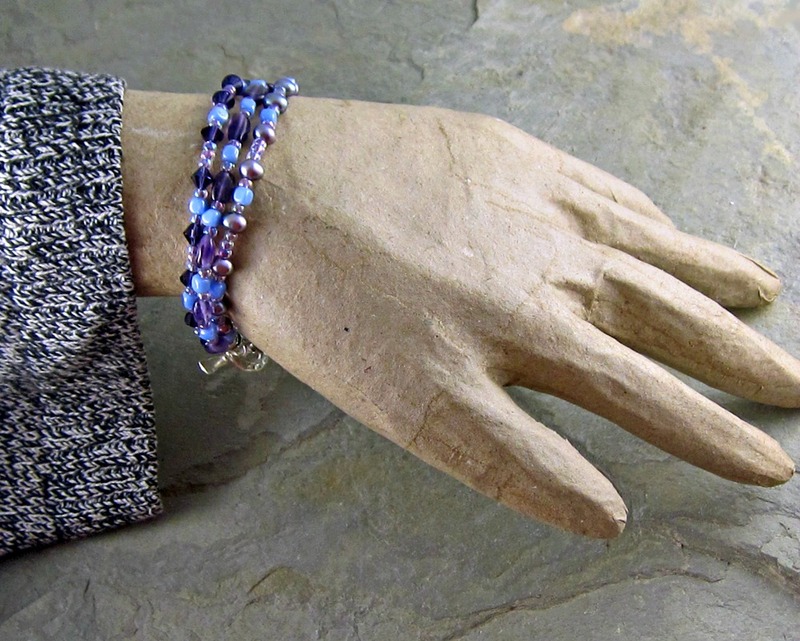 The Iris Bracelet is available on my website. The Component of the Month Challenge is a blog hop. Enjoy all the eye candy by visiting the links below. Once a month Art Jewelry Elements (AJE) hosts a component giveaway and jewelry reveal. December’s component was made by Diana Ptaszynski of Suburban Girl Studio. Members of the Art Jewelry Elements team, plus a few lucky guest artists were given one of these awesome ceramic snowflake pendants to design with. Today we get to see what everyone created! 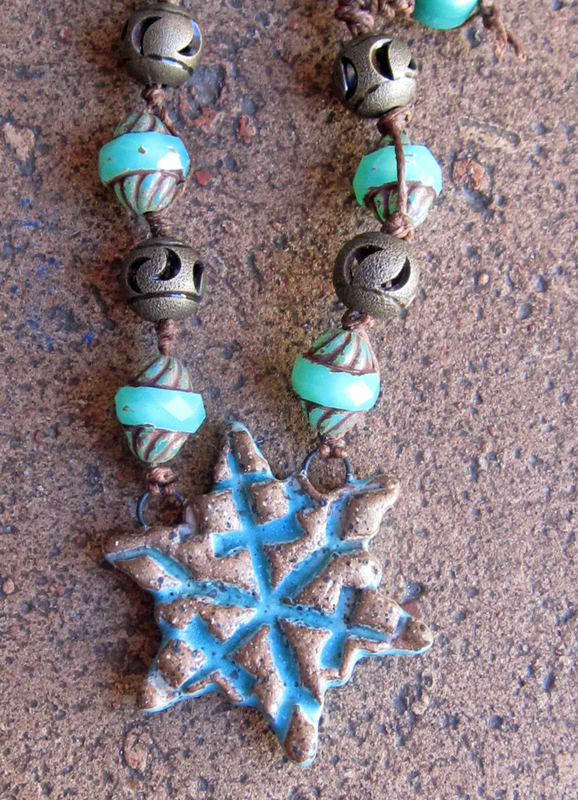 I received one of the turquoise snowflakes to work with. I decided to highlight the triangular shaped points of the snowflakes, by using some bicone shaped beads and by creating a triangular shaped clasp. The triangular link is based on a link from Cindy Wimmer‘s book The Missing Link. I used a bit lighter gauge wire and made it a bit smaller, so it wouldn’t overwhelm Diana’s pendant. 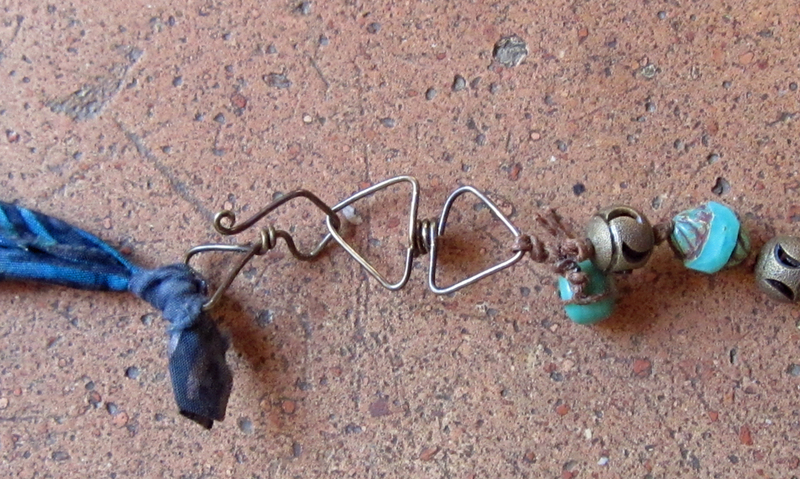 Then I used the same basic idea, but created a hook on one end, so I could use it as a clasp. The beads are strung on walnut colored Irish waxed linen. The beautiful batiked ribbon wrapped a bead order I got from Karen Totten of Starry Road Studio. 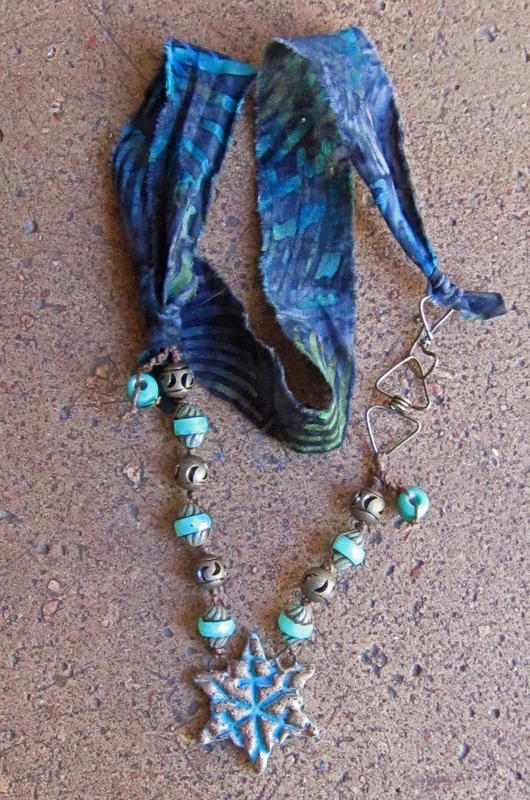 It has some turquoise in it, along with shades of blue, black and green. So pretty and it was a perfect finishing touch for my necklace. Thank you Diana for sharing your pendants with us! Visit Suburban Girl Studio to see more of Diana’s work! Want to see more gorgeous jewelry with Diana’s snowflake pendants? Click on the links below to see what the other participants created. Have fun!